As a vocal feminist with many intelligent, lovely male friends, I’m often met with indignance when I choose not to engage with them about feminism. Surely if I reallycared about changing our culture of discrimination and inequality, I should be trying to educate men? Isn’t that an activist’s job? Shouldn’t feminists be grateful when men want to bounce questions off us, because it shows that they are at least trying to understand? There are days I am tired of doing disability based education and awareness. It is in fact exhausting at times. I have been at it for 35 years. When is the typical bipedal person going to finally get it. I am a human being that just happens to be paralyzed. The barriers that exist are socially constructed. So I like it when someone else reaffirms it is okay not be nice all the time. It is okay to be angry. And ignorance is no excuse for bigotry. Get educated people! My wheelchair frame is old. I am guessing it is at least 20 years old. As of today, I have two wheelchair frames. A third frame was retired a few years ago. The frames have worked wonderfully for me. The frames have one drawback: they are heavy. Really heavy. This was never an issue. I wanted a wheelchair that suited my lifestyle. It had to take abuse and operate flawlessly in all weather conditions. Routine problems such as flat tires had to be easy to repair. It needed parts I could find them at any hardware or bike store in the world. I regularly change the upholstery and tires. Every five years or so I have the frame powder coated. Major problems had to be possible to resolve. For example, many years ago Northwest Airlines cracked the frame. I vigorously complained and insisted the frame be repaired. Hours later I had it welded back together in an obscure jet hanger in Detroit. While the frame was repaired I had a nice chat with a mechanic who told me the airline routinely breaks even the hardiest products in its cargo holds. In recent years my life style has changed. I am settling into middles age. Sigh. I do not travel as much and when I do it is from one airport hub to another. I am active but in a middle aged way. I do not take stupid risks assuming all will be well. More to the point, my wheelchair is heavy and is at this point verging on too heavy. In short, I need a I need a new wheelchair. I have been searching for a good wheelchair for the last two years. My search has reminded me why I despise wheelchair manufacturers. One can purchase a slew of inferior wheelchairs for thousands of dollars. My needs are simple: I want a wheelchair that is light and tough. I want excellent wheels and the best hubs money can buy. This presents a multitude of problems. Wheelchairs are not made to last more than a few years. The wheelchair industry is dominated by one company--Quickie. The Quickie corporate entity Sunrise Medical is the modern day equivalent of Everest & Jennings that once enjoyed a monopoly on wheelchair manufacturing. The mere mention of E&J decades after they went out of business still prompts me to utter a string of curse words. E&J was despicable company. Sunrise Medical is not much different. I see lots of Quickie wheelchairs in various states of disrepair. I am not at all impressed. They have a lego approach to wheelchair building. They use the same parts on all the wheelchairs manufactured. The designs are periodically changed but there is one constant: they are poorly designed and fall apart after a few years of use. I would rather crawl than buy a Quickie wheelchair. Plenty of small companies manufacture wheelchairs. They eek out an existence in the shadow of the giant Sunrise Medical. Some small companies make a profit and cater to specific clients. The current climate in the wheelchair industry reminds me of the late 1970s and early 1980s when the E&J monopoly was busted by the Department of Justice. Every paralyzed person I knew back then despised E&J. If my memory is correct my first few wheelchairs were E&J Stainless steel sport. These wheelchairs weighed about 50 pounds and screamed danger, sick person present. Worse, these wheelchairs were designed to be used indoors by an elderly person and could not be purchased without a physician’s approval. E&J wheelchairs were substandard at best. E&J wheelchairs had not changed for decades. Wheelchairs were literally a cash cow. E&J knowingly and willfully stymied any attempt at innovation. One could fold an E&J wheelchair but the frame was very weak. When a frame cracked, as they routinely did, E&J considered going up or down a curb and many other routine activities "abusive". I went through a lot of wheelchairs. Worse, the people that worked for E&J were condescending and rude. Thanks to the Department of Justice, social and legal advances, and decades of angry customers a revolution took place in wheelchair manufacturing. The rigid frame was invented. Power wheelchairs were also invented at this time but that is a very different story. Rigid frame wheelchairs originated in California. People with a SCI for the first time in history were not only surviving but thriving. The Vietnam War certainly was a major variable as was the fact spinal cord injury was the signature would of that war. A critical mass of pissed off paralyzed people had been obtained. With nowhere to turn paralyzed men and women started to experiment. Lots of people began to make wheelchairs that were sturdy and could withstand the rigors of a typical life. People began to borrow ideas from the aviation, motor cycle, and bicycle industry. Fabricators got involved as did various industrial designers. Within a few years rigid framed wheelchairs developed a cult like following. People had heard about the rigid frames and the cool factor was off the chart. Keep in mind back then there was no such thing as the internet. Adaptive sports consisted of wheelchair basketball. Wheelchair basketball and tennis wheelchairs did not exist. Sit skis did not exist. No one thought of making a well designed wheelchair for a specific sport or purpose. Paralysis, people assumed, precluded involvement in sports and an active life. Rigid frame wheelchairs were not mass produced in the late 1970s and early 1980s. They were made one by one. They were made largely by paralyzed people in their garages. Some were made by physical or recreational therapists who became friends with paralyzed people. The people that made rigid frame wheelchairs also sold and marketed their product. The market was friends and friends of friends. It was not unusual circa 1980 in California for a person to show up at the door of a person that made rigid frame wheelchairs and ask for one to be made. Why were people so excited? Rigid frame wheelchairs do not break. Welds held up under rigorous use. A host of colors were available for the first time. Wheels and hubs were of high quality. Quick release hubs were utilized. All this is commonplace today but back in the day this blew people’s mind. It blew my mind. A wheelchair that did not break, came in any color I wanted, and could last a long time. Dozens of companies popped up. Bob Vogel has written about the origins of the rigid frame in California. Graham Pullin touches upon the subject in in his book Design Meets Disability. At first glance, a wheelchair appears to be simple. Four wheels and a seat. The fact is making a durable, tough, and light weight wheelchair is exceedingly complex and requires technological sophistication in multiple fields. Radical innovation is also not easy to see. Instead, radical innovation is felt by the user. Such innovation is costly and dependent upon the durable medical goods industry. Another significant variable is wheelchairs are manufactured for what health insurance companies are willing to cover. The same problem exists in adaptive sports. Hand cycles, sit skis, basketball and tennis wheelchairs are made to meet the needs of adaptive sport programs not the athletes themselves. The result is a limited number of spectacular and empowering products have recently emerged that no one can afford. Last summer I tried the Panthera X. The wheelchair in my estimation is the first radical leap forward in wheelchair design since 1980. The wheelchair is deceptively simple. It is an elegant design that took years and millions of dollars to create. The Panthera X is marketed as the lightest rigid frame wheelchair in the world. I took it for a quick spin around a parking lot and was flabbergasted. The wheelchair weighs 9.7 pounds and the frame is made of carbon fiber. The down side is the price. It costs in excess of $10,000. All its parts are proprietary. Thus if any part of the wheelchair breaks life will come to a sudden and dramatic halt. A person needs to shell out $10,000 and have an operational wheelchair in reserve. 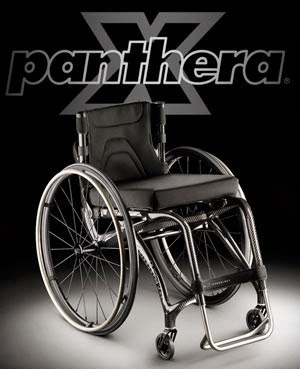 The Panthera X wheelchair cannot be insured. I would have serious concerns about getting on an airplane with an uninsured $10,000 wheelchair. This makes no sense. You can insure a car and a cell phone but you cannot insure a wheelchair. And more to the point, how many people can shell out this sort of money when70% of people who are disabled are unemployed. But what the heck--the cool factor is off the chart. Let's put this in perspective. The above massively cool life altering Panthera X wheelchair costs in excess of $10,000. The Nissan Versa 1.6 costs $9,999 brand new. A car costs as much as a manual wheelchair? Really? Do not get me wrong. The Panthera X is an amazing wheelchair. I am sure about 1,000 people in the United States are going to be thrilled with this wheelchair. That leaves several million other paralyzed people that will move on with inferior short lived wheelchairs made by Quickie. This makes no sense. But I have a dream. In order to empower paralyzed people here is what I think should be done. If appropriate purchase a Panthera X for a paralyzed person. Give a person 6 months of intense rehabilitation. Give a person his choice of a handcycle or sit ski. Give this person two years worth of lessons at adaptive sports centers. Send this person to college or place them in a work study program. Have a job placement office at the rehabilitation center. Finally give this person a life time supply of wheelchair cushions and urological supplies. Sound expensive? You bet. And there is not a doubt in my mind this would save hundreds of millions of dollars. Imagine if it reduced the unemployment rate among people with a disability from 70% to 20% That would mean 80% of people with a disability would be working and paying tax. There would be a demand for accessible housing and transportation. The world would be a better place. Lives would be saved. And sadly I am dreaming. It ain't never gonna happen.